28875 W. Seven Mile Rd. Dear Pastors, Churches and Fellow Saints. We send greetings from the churches of the many states we have been traveling in. In September and October we had the privilege to present our mission work and update many churches in Michigan, North Carolina, Virginia, Alabama, Florida and Georgia. It was a lot of traveling, but we had a wonderful time. It brought us much joy telling everyone what the Lord has been doing in Bulgaria and Romania as well as seeing what the Lord has been doing in the churches we visited. In October my son James was operated on for the third time due to a knee injury. The surgeon was very pleased with how it went. It will take about a year for him to totally recover, but James has a good attitude about it, and is thankful as well as we, are for all Dr. Gibson and the Lord has done for him. I'll also covet your prayers, because it looks like I will need my shoulder replaced in the near future. We have begun taking up offerings for the 2018 flower and oil distribution in Bulgaria this winter. We will give each family 110 lbs. of flour and a gallon of oil. This provision helps them make it through the long winters. We have seen many rejoice in the Lord from this, and testify that "God can furnish a table in the wilderness". Please, also keep my father Martin Welch in your prayers. We celebrated his 86th birthday in October. In July and August we visited and presented our mission work at churches in Tennessee, North Carolina, and Virginia. We had not been to some of those churches in years. It was a blessing to gather together and rehearse once again what God has done on the mission field in Bulgaria and Romania. It was a blessing to also hear from them what the Lord has been doing in their churches and ministries in America. It is good to be back on furlough and not only to visit with the churches but also with family and friends. I am especially thankful for another opportunity to speak to our lost loved ones about their soul's need of salvation. God is dealing with them and our prayer is that they will open their heart's door and receive the Lord Jesus Christ as their Savior. It has been encouraging to see some who were so hard and cold to God and the gospel to give ear and listen with open heart and mind. I believe they are in the place of Isaiah 1:18 where the Lord says "come" and "reason". If you are interested in seeing the work presented or having us come and preach please call me at (828) 592-1498. If you should not be able to reach me at that number I can also be reached at (423) 878-5800. We're looking forward to seeing all of you and fellowshipping and praising God together. It was 1993 the Lord called us to "Come over into Macedonia and help" (Acts 16:9) in God's work under Brother Ralph. It was he who greeted and welcomed us to the mission field. From that time until now Brother Ralph has shown us God's strength and power as manifested in the New Testament, and that without it, God's work cannot be done. From the beginning he has put emphasis on the Word of God, on holding church services, worshipping God, and on prayer. Through these things we have experienced and witnessed God's strength and power. God has done great things here through Brother Cheatwood. He has translated the King James Bible into the Turkish language and put together a hymnal containing 250 songs that worship God and His Son. He also started over one hundred churches and a children' home in Constanta, Romania. I would like to thank the Lord for a man of God like Brother Ralph. His desire is for everyone to come and know and experience God's strength, power, and righteousness, and to behold His great things. We send you all greetings from the saints in the Lord Jesus Christ here. First, we would like to thank you for your prayers and faithful support through the years. We count it a great privilege to be your ambassadors for Christ. One of the greatest joys I have is to be able to preach the gospel of the grace of God. The other week we had the blessing of having some American soldiers visit our services in Constanta, Romania. They are stationed here and were invited to a service and wanted to see the children's home. One woman came and she enjoyed the home, food, and the children; but then she heard the word of God preached, and enjoyed getting saved and so did we. It is a wonderful sight to see someone come to the Lord. Many soldiers are here for only a short time, but we have seen how God has used us poor, sorry as can be sinners, to tell them about God, His love, and how Jesus can save them. Secondly, we are really looking forward in 2018 to be in America and visit many of you. We have been on the field for 25 years and it has gone by so fast. The last time we were home for a furlough was five years ago. I know many of our friends and supporting churches have not seen us for many years, so we are looking forward to trying to see each of you. You are in our prayers often, and we know we couldn’t be here if it wasn't for God and his people. I would also appreciate everyone keeping my family and myself (namely my health) in your prayers. I really believe the Lord’s ears are open to our prayers. James 5:16. In closing, our prayer is that God's Spirit would move, not only in our services, but also in yours and that Jesus Christ would be lifted up, and all men would be drawn near. P.S. We are still working on the church building in Vaglin. Hopefully we will finish soon. Thank you for all you have done to make this possible. Greetings from the happy location of a marriage! 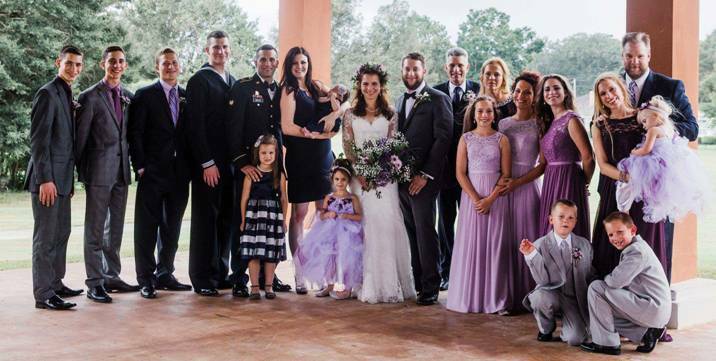 On October 7, 2017, the Lord made it possible for our whole family (all 21 of us) to come together for the marriage of our daughter, Rebecca, to Mr. Jesse Lee Adcock. It was a beautiful wedding and the Lord blessed us with His presence there. It brought back many fond memories for me and my wife of our own wedding 34 years ago in the same location. It was so wonderful to enjoy this special event with our loved ones and our Lord. Our hearts were filled with joy and gratitude for the time that we could spend together with our family. We ask God's blessing upon Jesse and Rebecca and that their love may continue to grow for one another and for the Lord. During the month of October, while we were in America we attended church services in North Carolina, Tennessee, and Virginia. I had the privilege of preaching in those meetings, and the Lord blessed. Many of our family members attended church services with us; and we were able once again to sing together for the glory of God, just like old times. On October 10th my father, Martin Welch, had his 85th birthday. I was able to be with him and with my brother Kevin and his wife Barb, who take care of my father. We thank the Lord for all the wonderful times He gave us with friends and family during our short visit to America. In the summer of 2018, we hope to return to America for a year-long furlough. We would love to visit you and give a first-hand report (Acts 14:27, 28) of the wonderful things that the Lord is doing on the mission field in Bulgaria and Romania. If you would be interested in setting up a meeting, please contact us. May the Lord continue to bless you abundantly above all that you could ask or think, according to His riches in Christ Jesus. Greetings unto you from all the believers that are among us. We want you to know you are in our prayers often and we thank our God for you all. In 1979, I gladly received the Word of God and the Lord Jesus Christ as my saviour. I was so sensitive to God's Spirit and His will. I didn't know much about God or His Word; but, whatever God wanted was what I wanted, and whatever His word said was good for me. I know it should go without saying that when someone receives God's word that they will follow the Lord, but oh how blessed it is to see it actually happen. We were in a church service not long after Bornchu was saved and mentioned to him we would be having a baptism service. We explained how baptism was a "demonstration of the gospel", and upon the profession of our faith in Jesus we may be baptised. Acts 8:36, 37 That is, buried in the likeness of his death and raised in the likeness of his resurrection to walk in newness of life, and that it was an outward demonstration of what had already happened to us inwardly. Bornchu received it gladly and was baptised when we held our baptismal service down by the river. All were happy to see him follow the Lord. Boncho's wife is Penka. She is a born again Christian and has been a member of one of our village churches for many years. In good times and bad times she has blessed the Lord. I have known her husband Boncho for a long time. He came to my house years ago and plowed and planted corn with a horse. For this work I paid him a piglet for which he was very happy. He is a nice man, but we could never get him to come to church. In June of this year this changed. Boncho found himself in a bad way and in need of some help that only God could provide. He showed up at church for the worship service where we sing, pray and preach God’s Word. The seed of God’s Word was planted. By the next week Boncho had gotten saved by receiving the Lord Jesus Christ as his Lord and Saviour. He was rejoicing with joy unspeakable and was full of the glory of God. 1 Peter 1:8 Oh my, how this made the church rejoice. No one saw this coming! We all felt like this farmer who “kneweth not how”. Our encouragement is how God’s Word is alive, and He is at work. We might "knoweth not how'', but we do have faith in God and His word. God has given us many promises concerning His word as in Isa.55:11. All I can say is, it’s a wonderful thing to see God's Word spring up and bear fruit in someone’s life and soul. We also have continued to work on the church building in Vuglen. It is coming along well. We still have some work to do, but hopefully it will be completed soon. My wife and I would like to announce the engagement of our daughter Rebecca to Mr. Jesse Adcock. Their wedding is planned for October 7th 2017, which we hope to attend in Florida. Please pray for them as they begin a new life together. Greetings from the blessed saints in Bulgaria and Romania! The churches I attend are doing well with many saints wanting me to send greetings to their brethren in America. In many of their testimonies they always thank the Lord for the missionaries that brought them the gospel. We remain encouraged in the work of the Lord knowing that He is among us and will supply our every need according to His riches in glory through Christ Jesus. We continue to print and hand bind New Testaments and to distribute them to our church members. They all feel very privileged to receive a copy of the Word of God and we feel privileged to distribute it. Many of you have helped to make this ministry possible through your generous offerings, faithful support, and steadfast prayers. We have started work on the church in Vugland (mentioned in a previous prayer letter) and hopefully we will be able to meet in it soon. We are thankful for the money that was sent in to help purchase this building and property. Mitko Stefanov is the pastor and is a blessing to all that know him and work with him in this ministry. I have been dealing with a man named Micky who lives in our village. He is 72 years old and is from England. We went to his house last week to help him fix his gate. He told us that he doesn't believe he has long to live. Pray for him that the light of the glorious gospel would shine in his heart and he would be saved. I know that most of you wonder about my health. I continue to have problems but God's grace is sufficient. Greetings from the churches in Bulgaria and Romania! I am very thankful to be saved by the grace of God and the blood of Jesus Christ, God's Son. I am also thankful to be called to preach God's Word and to be a missionary with the mission of preaching the gospel of Christ. (Rom. 1:16) In 1979 my uncle, Don Welch, made a big difference in my life by possessing the compassion and love of Christ to testify of God's great love displayed for me in John 3:16. It's my desire to make a difference in my family, my neighborhood, my church, and on the mission field. The Apostle Paul said that the love of Christ constrained him and Paul definitely made a difference in countless lives for Christ. We all have so many people that are acquainted with us every day. Some of the ones I'm associated with are Zefko, Ivan, and Baba Danka and so many others. Some are saved while others are not, but if something is going to make a difference - it would be compassion. For over 23 years we have seen many people's lives changed from the preaching of the gospel of Christ. They have come from darkness to light and you have been a part of this ministry by your faithful prayers and support that comes from your compassion. I would like to personally thank you all for "making a difference". In closing, I would also request that you pray for God's mercy and presence for one of my closest friends who has a brain tumor, Preacher Don Medley, of Brookside Baptist Church in Sugar Grove, Virginia. His love and compassion for saints and sinners has made a big impact through the years in that part of the country. I know that he and his wife and family would appreciate the Lord's people holding them up in prayer during this difficult and trying time. Greetings from the saints in Bulgaria and Romania that are among us. In these last months we have seen the Lord touch people's hearts and provide grace for others. Mitko is a neighbor of mine. He is 65 years old and a very good and nice man. But he is not saved. He showed me some work he wanted done on the house that he and his mother live in. I encouraged him to let me and my boys, James and John, to help him do it. 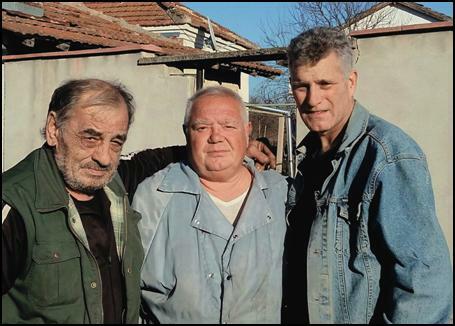 We worked for many days with Mitko and his cousin, Stoichko. We worked hard, but the work went well and it was worth it. 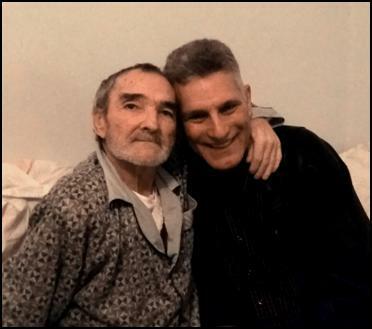 One night when we were done I talked to Mitko and his mother, Baba Penka, about the Bible, salvation, and the Lord Jesus Christ. Baba Penka was so happy that the Lord had opened the door for me to talk to her son. The next day I gave Mitko a New Testament. Since then, he has already read it five times and said he understands it better every time he reads it. We are thankful that as we continue in one accord to praise God that He continues to work among us and touch people's hearts. 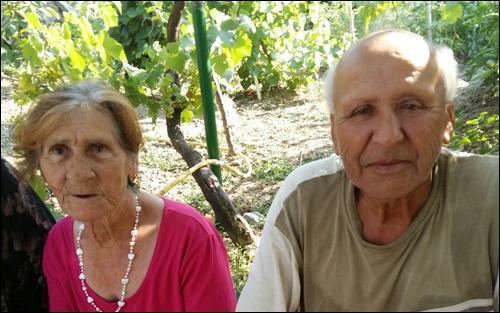 Please pray for: Mitko, Stoichko and Pastor Ahmet. We ask that you would also pray for one of our national pastors who name is Ahmet. He is very ill and not expected to live much longer. He has fought a good fight and has kept the faith. Greetings from all the saints that are among us to you. The building we are hoping to purchase in Vugland. Baptizing a new convert with Pastor Mitko. Most of our church meetings are held in believers homes. These Christian saints have seen how God has blessed them with His joy for opening up their houses. They have seen the Lord use their homes as places of worship as in Apphia’s home. (Phil. 1:2) In some places we have church buildings and every so often God lays it on our hearts to try to obtain an older home to purchase and use as a meeting place for the church. Periodically, we hold special revival services and bring many of the different village churches together. We help transport the people with our vehicles and all of them are very happy and thankful to have the blessed opportunity of attending the meetings. Sometimes the meetings last for just one day and other times they continue for three days. During this time everyone is served meals and even given a place to sleep when necessary. The fellowship is so precious to behold and reminds us of the fellowship that we have enjoyed while at the churches in America. Brother Matt preaching in the village church of Dabravino that he helped build 15 years ago. The last time we held a special meeting I had driven my van to a certain town and was waiting for everyone to show up before we headed out. A man named, Rozdi, came by and asked where we were going. When we told him that we were going to church he jokingly asked if any girls were going to be there. The believers in my van didn't think it was funny at all and started correcting Rozdi for his joke. However, I told him that there were going to be girls but that these girls loved the Lord and were walking in His way. Then I invited him to come along and before I knew it we were headed down the road to church with this man. Later that night, after six hours of preaching, singing, testifying, food, and fellowship, we headed back home with our hearts overflowing. I haven't seen Rozdi since that day but I know the Lord touched his heart. I look forward to inviting him to come to church again that he might hear the glorious gospel of salvation and believe on the Lord Jesus Christ. Oh Lord, give us courage to go out into the highways and hedges, and to compel the careless, comfortless, and the forsaken to come into Your House that it may be filled! Greetings and thanks from the churches here in Bulgaria and in Romania. 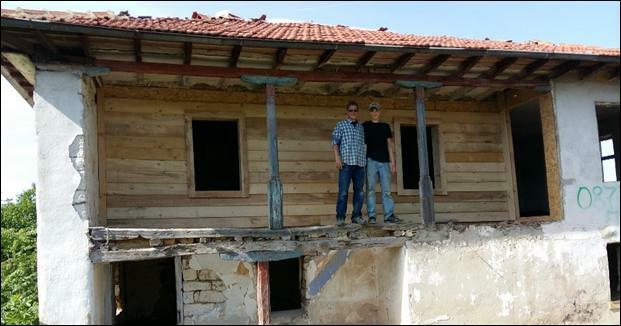 We have been very busy working hard on a church building in Avren, Bulgaria. This lovely village is located about 15 minutes away from Dabravino where we reside. The other fellow missionaries and even my two 15-year-old sons, James and John, are helping with the work on this building. Some churches and individuals in America have given to this project and we are sincerely grateful for their generosity and kindness. We still have a lot of work that remains to be done until the building is finished but we are trusting in the Lord's grace and help to complete it. Please keep this matter in your prayers. We look forward to the day when we can meet together and worship the Lord in this building. We have been enjoying good meetings, down the road from us, in the little village of Yunak. It's a blessing to see the folks coming out faithfully to church. The village has only a little Orthodox church and it is hardly ever open. We are thankful to be able to meet together with believers there who desire to worship the Lord and fellowship with the saints. We hold weekly services in Yunak, at the home of a 74-year-old man named, Malcho. For many years now Malcho has had a church meeting in his home. He has been faithful to the Lord even through the hard times and loves to testify about God's saving grace. I thank the Lord for this man who not only opened his heart to the Lord but also the door of his home, nearly 20 years ago, so that we might have a place where we could worship together. Above, Matt gave Charity a rooftop tour of the church in Avren that she'll never forget. An inside view of the second story of the church. And, James and John are helping out with the work on the church building. At the beginning of this year, we began having special meetings every month in Romania and Bulgaria. In May and June, many of the believers were blessed to come to a meeting where many villages were represented. Most of our churches are house churches like in Romans 16:5 and cannot accommodate large groups. Through these meetings, many, as well as myself, have been built up in the faith, encouraged, and edified. There is nothing like a good church service that God is in to get you revived. As the church increases in number, so does the need for New Testaments and song books. 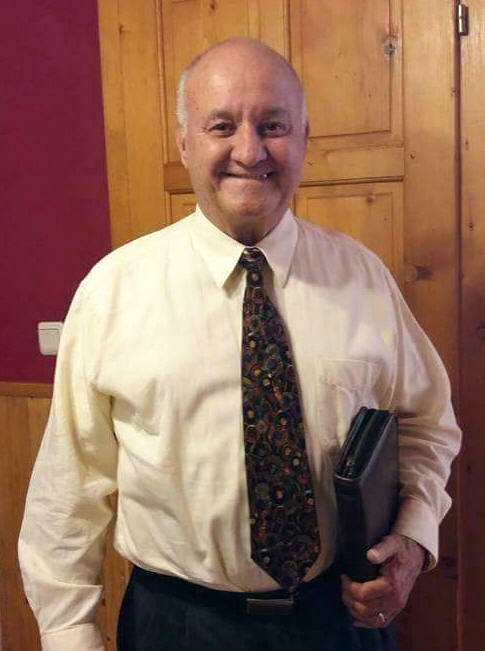 A few years ago, the Lord laid a burden on the heart of our senior missionary, Ralph Cheatwood, to purchase a house in Avren, Bulgaria. This house will be used as a Bible and songbook manufacturing center, as well as a church building. We have started to work on this building, and to complete it we need approximately $20,000. Once a young enthusiastic Christian asked a wise old spirit-filled preacher for advice in serving God. The wise old preacher told him “Son, find out what God is doing and get in on it.” And to God’s credit, He has carried us along and let us get in on what He was doing; namely, building His church. Jesus said “I will build my church” (Matthew 16:18) and I read in the Bible “…It pleased God by the foolishness of preaching to save them that believe” (I Corinthians 1:21). In March and April, we were very busy distributing 110lb sack of flour and a gallon of cooking oil to each family in our churches. The Lord has shown compassion on many of the poor believers by supplying handfuls of purpose and blessing his people. Most of these believers live hand to mouth, that is from God’s hand to their mouth. While most of them are poor, I have come to learn they are rich in faith (James 2:5). If there was a group of Christians you would want to pray for you, this would be a good one. They just believe God will hear us when we ask, seek, and knock. I guess we call that the faith of a little child (Luke 18:17) or of a submissive centurion (Matthew 8). Although they believe God has provided this food for them, they all express a thankfulness for the Christian believers in America compassionately and faithfully supporting God’s work. As a missionary sent out to preach the gospel in the regions beyond, it has been my privilege to preach how the Lord Jesus Christ is the Bread of Life and can satisfy our spiritual hunger (John 6:35). I have also seen how God can provide a table in the wilderness by supplying all our need in Christ Jesus. God has blessed the distribution of flour and oil for many years. We have seen and heard many testimonies of how believers were hungry and God provided. A woman in one of our churches had only a little flour left. Her husband told her to go borrow money to buy more, but she told him that she believed God would provide for them. That same day we delivered flour and oil to her door. Her husband couldn’t believe it, but she told him “I knew God would take care of us” (Psalm 37:25). We send greetings from all the churches here. We are bound to thank God always for you, brethren, as it is meet, for all your prayers, support, and fellowship in the gospel. As many of you know, some years ago, the Lord blessed the believers here by visiting His people in giving them bread (Ruth 1). For the last 21 years we have preached that Jesus said “I am the bread of life, he that cometh to me shall never hunger, and he that believeth on me shall never thirst”. Thank God we have never hungered, nor thirsted spiritually. Jesus satisfied our soul’s hunger and thirst, and filled our hearts with His love. But God has also supplied our physical needs. They asked,” Can God provide a table in the wilderness?” We answer, ”Praise God, yes!”. He has provided, He is providing, and He shall provide for His people. When Ruth heard that the Lord had visited His people, in giving them bread, she was touched and moved. Through the years we have seen God visit his people, and bless them through your prayers and support. 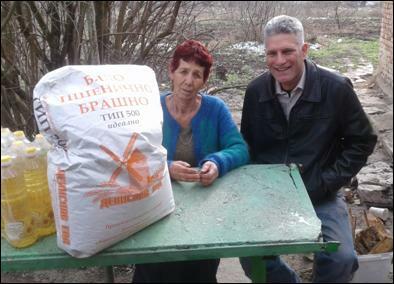 We started years ago in Bulgaria helping the needy church families with food. What began with a two pound bag of rice and beans, and a 10 pound bag of flour has now grown to a 110 pound bag of flour, and a gallon of cooking oil. This is distributed once a year during the winter. This amount helps many believers through the "HARD PART" of winter. After our last camp meeting in Romania, senior missionary, Ralph Cheatwood asked me to come back to America to tell the churches about this need, and how God has touched many hearts through the flour and oil distributions each year. Being assuredly gathered that the Lord had opened the door I arrived in early October to America. I have traveled 5,000 miles in one month and have attended over 25 church services. I will return back to Bulgaria in early December. Many churches have said they would like contribute and have done so. We know many more would like to be a part of this blessed endeavor to help “send portions unto them for whom nothing is prepared”. Philemon is addressed as a fellow laborer. Thank God for fellow laborers. One of our fellow labors is a man named Ahmet, who was saved about four years ago in a village called Kamendyal. Ahmet is a laborer for Jesus, and a blessing to me. He set aside a room of his house, and prepared it just for church services. He not only labors with me in and for the gospel, but also labors fervently for others in prayer. Like Nehemiah, I am encouraged to have fellow laborers to help build the walls for the protection of God’s people. We also thank God for fellow soldiers in the church, men like Alish, Ismail, Malcho, Demir, and many others, as we not only have a work, but we are also in a war. Praise God for men that are earnestly contending for the faith; and that are not ashamed to shout for the battle; and are prepared for the fight. The Captain of our salvation, the Lord Jesus Christ, is our leader and head. He is the one we are looking unto for victory. All these men helped me personally in the work of the ministry. During July and August we met many times together to have our weekly services, as well as special meetings. During this time as well, some 50 adults were baptized upon the profession of their faith in the death, burial, and resurrection of the Son of God the Lord Jesus Christ. We send greetings from all the saints that are among us in the Lord Jesus Christ. In times of trouble the apostle Paul testified that the Lord spoke to him (Acts 18), stood by him (Acts 23),and continued with him (Acts 27). In times of despair, trouble, and uncertainty, I am thankful that the Lord has promised us as believers that He will never leave us nor forsake us. (Heb. 13) There is no one like the Lord. His word is alive and His presence is life changing. In the months of March and April, we again held special meetings. We brought some of our local churches together for revival services. We have tried to continue to do this every month for the purpose that everyone may grow and be edified in the Lord and many have been helped. Many of these people have never even been out of their village so for them it is special to come to a revival meeting. It also has been good for their local churches because after the meetings almost everyone returns “fired up” and testifying of God's goodness. Many of you know that last year with your help we were able to purchase a few vehicles for some of our national pastors. They were all very thankful to God for you all supplying this need. It has been a great help and blessing. These men have meetings almost every day of the week and you have helped to enable them to feed the flock of God. The last time I purchased a vehicle for myself was almost ten years ago. My van has over 500,000 km on it. This van has been a great help to the ministry from bringing people to church to delivering food to the feeding centers. We would like to purchase another vehicle for the work. We could really use your help and prayers. It is much needed and will be used for God's service. In April, we returned to America for six weeks. During this time we were able to visit my 82 year old father, attend a family reunion, and go to my daughter's graduation from college. Rebecca graduated with a degree in Nursing. Unfortunately, I had to be hospitalized the day after we arrived in America. I started having problems on the trip over. I was in the hospital for three days. Due to these unforeseen circumstances, this letter is just now getting to you. Our desire is to return to America again in two years for a furlough; at which time we would like to visit all of you. The first two months of this year have gone well. We held another revival meeting in late January. Usually due to the weather we are unable to have meetings at this time of year; however, it was very mild for January, so we decided to schedule a meeting. For some of the people who came out, it was their first time to hear the gospel preached. The Lord dealt with many hearts and we had very good services. The next morning we woke up to a snowstorm. It was the first snowfall of the winter and it was a heavy one. A couple days later another big storm hit and we got even more snow. We were "snowed in" the village for nearly two weeks. We were very thankful to God that we had been able to have that revival meeting and that everyone had returned safely to their villages before the blizzard hit. We are trying to have these special revival meetings at least once a month. We bring together people from a number of the churches we have started. Whether from a gospel song, a testimony, preaching or the fellowship of the believers in Christ; everyone is helped by these meetings. There is definitely no shortage of finding people who want to come. One man, named Rayim, gave a testimony and said that before he was saved he went to one of these revival meetings. He looked at the believers who were enjoying the service and said to himself, "They are all crazy!" But a little while later he was under conviction and thought, "Are they crazy or am I the crazy one?" Soon after this Rayim was sent to prison. He began to pray to God that the warden would give him a week pass to go home. He told the Lord that he wanted to go back to church. When the other inmates heard what he was praying for they laughed and told him he was crazy. They said the warden would never let him go. But the next morning, to everyone's surprise, the warden called him into his office and gave him a week pass to go home. Well, he returned home and went to church, and got saved by the grace of God! Upon returning back to prison, Rayim chided himself for not having asked the Lord to release him indefinitely. He began to pray about his release and again the other inmates laughed at him. Amazingly, the next day he was called once again by the warden who told him, "You have been a good prisoner so today you will be freed." He was so happy! When the inmates heard this news they couldn't believe it and said, "We want to become believers, too!" Rayim returned home and now attends church regularly. He loves to tell his testimony about how the Lord delivered him. The Bible says in Acts 12 that "the iron gate...opened...of his own accord" letting Peter out of prison. Only the Lord can so miraculously deliver those who are in bonds. We pray that God might work this same way in all of our lives, and in the lives of our loved ones. We send greetings from all the churches that are among us in Christ Jesus. Grace be to you, and peace, from God our Father, and from the Lord Jesus Christ. We would like to praise the Lord for visiting his people in giving them bread (Ruth 1). God has greatly blessed the flour and oil distribution of 2013. To date, we have distributed over 140,000 pounds of flour and more than 1,500 gallons of oil to the families in our churches. Every family receives 110 pounds of flour and a gallon of oil. For many who live from hand to mouth, and truly live by faith, this is such a blessing. They rejoice how God has provided for them during the most difficult time of the year when most people have no work or money. Many people have gone to Germany or Holland to find work but most have returned empty and hungry. I cannot begin to tell you of all the joy that has come from the most needy believers and how they have testified about God providing for them. They give thanks to the Lord for laying the Bulgarian Christian believers on the hearts of American Christians. A woman from the village of Sadovo said, "I am a shut-in and I was going to ask someone to buy me 10 pounds of flour and I would try to repay them when I received my pension. That same day the pastor came with a truckload of flour. The Lord gave me ten times more than I asked for! Praise be to God!" In Yankovo, two families were living together for the winter. By February, all the canned goods they had laid up for the winter were gone, as well as the flour. As they were going to the store to see if they could get credit for a 25 kilogram bag of flour, word came to "Bring your horse-cart to the church. God has given us flour!" They returned home praising God, with 50 kilograms of flour and a big jug of oil. In another village, a Christian woman was praying as she watched her family shaking the last of the flour from a sack. Some neighbors made fun of her as they watched her praying for more flour. Then, they heard that a truckload of flour had just arrived at the church. The woman ran and told her husband, "See there is a God, and He has heard our prayer! Before the bread ran out He has given us more!" We have seen thousands blessed and provided for by the Lord's hand. Truly, many here pray, "Give us this day our daily bread", and He still answers prayer. To God be the glory! Greetings from the churches in the Lord Jesus Christ which are among us in Bulgaria and Romania! We are bound to thank God for you all, and for your prayers and support of the Lord's work here. From the weekly services, to the many special meetings that we have held throughout the past year, God has been so good to us, and we have seen His people grow in grace, and in the knowledge of our Lord and Savior Jesus Christ. In November and December we were occupied mostly with our meetings. We have nine different villages that we attend weekly. The believers here pray for the American believers and are thankful for them sending someone to tell them about God's plan of salvation, through the Lord Jesus Christ. They are very open to the gospel. Rarely do we have someone turn down gospel literature, or DVD's with preaching and singing. We thank the Lord for the numerous opportunities we have to present the gospel and to help others who are in need. Recently we had the blessing and privilege of seeing a 60 year old man named, Ahmet, come to Christ. He is from the village of Kamendial. Please remember to pray for him. In December the Lord blessed us with the happy reunion of all ten of our children (and a son-in-law, a daughter-in-law, and three grandchildren). It had been five years since we all had been together. We are so grateful that we were able to celebrate the holiday season at our home in Dabravino, Bulgaria. Please continue to keep us and our ministry in your prayers. During the month of August, we held special Turkish meetings in Constanta, Romania. We traveled from Bulgaria and made a couple of trips back and forth in order to bring some of the believers from Bulgaria. Unfortunately, we didn't have enough room to bring everyone that wanted to come. Some of the people we invited were not Christians, but we invited them in hopes that they might become believers in the Lord Jesus Christ. Pappe, is a 21 year old woman whose mother is a Christian. We hold church services in her mother's home every week. 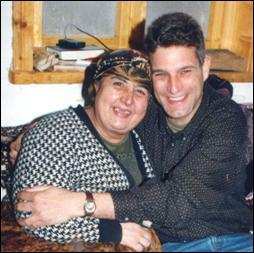 Ahmet, a national pastor, had a burden for Pappe; so he invited her to attend these meetings. Even though she was not a believer, she accepted the invitation and came with us to Romania. We have seen His power in action and His Spirit dealing with many souls. But, I must admit, I didn't know God was dealing with the young woman. Pappe stood up, during one of the meetings and told everyone that she was not a Christian. However, after listening to the singing and testifying, and hearing the preaching of God's Word, she now believed with all her heart that Jesus died for her and rose again. Her testimony has been an encouragement to all of us as we see how God is working in her life. She came to the church meeting in Romania empty, but she left full. By the time she returned back to Bulgaria she was on fire for the Lord. A few days later, I heard her testify about the meeting in Romania, at her mother's home. Her face was glowing and her heart full of joy because the Lord had saved her. She said, "I just believed on the Lord Jesus Christ and I was saved. That's all I did!" In Turkish it translates, "Bu kadar yaptim!" A week later, Pappe attended a baptismal service in Dabravino. 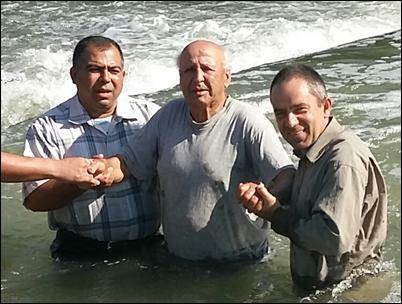 The believers gathered around the banks of the river and sang hymns as Pappe was baptized. Before closing this letter, I would like to mention that in September, 2010, I was diagnosed with Parkinson's disease. I am still in the early stages. The Lord is helping me; but, I do covet your prayers. I count it a great privilege to be on the mission field. I know that God's grace has been sufficient in the past and am confident it will be so in the future. We send greetings to you from all the saints that are among us. These past few months have been very busy for us. We’ve been going to church meetings almost every day, and have helped to distribute over 190,000 pounds of flour and oil to hungry and needy church families. I count it a real honor to be here on the mission field, and see the Lord work. What a privilege and blessing to labor together with God (1 Cor. 3:9). It makes all the difference when He is working with us, but how vain it is when we try to do the Lord’s work alone. We ask that you continue to pray for a young man that attends services with me named Remzi. He is 19 years old and is the grandson of Pastor Hassan who passed away last year. We have a real need for national pastors. Please pray that God would have His will in Remzi’s life, and that this young man would go with God, whether or not He calls him into His work. His grandmother, Kadrie, still comes to the meetings and helps with the singing and testifying. She is in poor health and we ask that you would remember her in your prayers. We have been distributing the Gospel of John and Romans in the Bulgarian language. It was translated by one of our national pastors, Mitko Stefanov, and printed by Bearing Precious Seed ministry in Ohio. It is still very rare to have someone refuse a gospel tract or pamphlet, or a Bible. The people here are very open to the gospel. Before we close we would like to mention one more special prayer request. We ask that you pray for Teresa Nixon, who is suffering from pancreatic cancer. She is the wife of Mike Nixon, our mission board director, and pastor of Brookside Baptist Church in Bristol, Tennessee. We know that they earnestly covet the prayers of the saints during this difficult and trying time. Greetings from Bulgaria and Romania! This winter was very long and cold. We are looking forward to warm weather, blossoming trees, blooming flowers, and the return of the songbirds. What a beautiful song they make and how sweet it comes to our ears! We have been enjoying good church services in the villages where we minister. We have been taking new believers around with us to attend these services and it has been a blessing for them. A new believer, whose name is Negibe, recently traveled with us to a few church services. She is about 55 years old and was saved and baptized about a year and a half ago. It was her first time to travel with us. From the moment she got in the van and heard the Turkish gospel hymns playing, she joined in singing and rejoiced the whole way to the meeting. When we finally arrived at the church, she could hardly wait to stand up and testify. She told how good the Lord was to her and that she was so glad to be saved. She also said that she wanted all of us to go to the village where she grew up and preach the gospel there. We told her that we would and she rejoiced. It was such a blessing and encouragement to be around a new Christian that hadn’t gotten over being born again. The church in Kamendale, was recently relocated due to the death of the 80 year old woman in whose home we met for years. We have started meeting in the home of another believer. She was saved a few years ago but her husband was not saved. Her husband would not attend the meeting in their home. We could, however, see him seated at the upstairs window listening to the preaching and singing. It continued like this for a couple of weeks. One day, her husband finally came into the service. He testified how he had listened for weeks, and the Lord had touched his heart. We are joyful to welcome him into the family of God. His is now inviting many people to come to the church services. It is wonderful to witness how Psalm 40:3 has come to pass. “He hath put a new song in my mouth, even praise unto our God; many shall see it, and fear, and shall trust in the Lord.” Please remember this couple in your prayers. Greetings we send you in the name of the Lord Jesus Christ. Mustafa is the name of the man we prayed for and witnessed to yesterday. He is up in years and unfortunately from lack of circulation had to have one of his legs amputated. The Lord opened the door that we could go and testify to him. After church his wife asked if we could come and pray for him. His wife became a Christian about 20 years ago along with many family members, but Mustafa never showed an interest. The national pastor Brother Demir, and I went to Mustafa’s home. Demir talked for awhile to him and then asked me if I had anything to say. I told Mustafa that I was sorry that he had to have his leg removed and that I could tell he was a real hard-working man. I told him that I knew it was difficult for him to be in a wheelchair. I said that my father had both of his legs amputated and I knew it was hard for him. We then testified to him how that one day the believers in Christ would have a new body that would always be whole. We as Christians are truly blessed with God’s peace, comfort, and promises in the Bible. Then we encouraged Mustafa to believe on the Lord Jesus Christ as his Lord and Savior. He sat there and listened and we were glad to take “good tidings of great joy” to him. We will return after a while and pray for him again and for his salvation. Please remember Mustafa in your prayers. During the months of November and December I had the privilege of visiting our churches in the cities of Dobrotich, Mihailich, Shumen, Brestak, and Suvorovo. Most of these churches were started some 18 years ago and are still going strong for the Lord. I really enjoyed hearing what Bro. Ralph Cheatwood, our senior missionary said when asked by a Christian what do we do here as a ministry. Bro. Ralph testified, “We have church.” This means we sing hymns, pray, testify, and preach from God’s Word. This is what we do when we visit the churches. It was a joy for us to return to Bulgaria and Romania. We love the people here and the Lord has knit our hearts together in love. It is a blessing that we have the privilege to preach the gospel of Christ. We have seen many people receive Jesus Christ as their personal Lord and Savior and become brothers and sisters in God’s family. During our furlough in America we received news about two of the believers passing away. Hassan, a national pastor that I worked with, and also our neighbor Grandma Gina have gone to be with the Lord. We were saddened by the news but rejoice in our hearts to know that we will see each other again in Heaven. Their testimonies live on here and the believers make mention of them in nearly every worship service. The national pastors are doing well and staying busy with preaching and visiting the churches daily. I have been attending meetings with a national pastor named Demir who has taken some of Bro. Hassan’s meetings. The Lord has blessed this and Demir was thankful that he could help fill the gap. He is a faithful Christian, and a good preacher, and has been working with us for about 18 years. Please remember him and his family in your prayers. The house churches are also doing well. Everyone was rejoicing to see us once again in the church services. It’s good to worship with the believers and to hear them testify about the Lord and His goodness to them. They never cease to praise the Lord in every service for healing their diseases, and meeting their needs, and for sending American missionaries to preach to them the gospel of our Lord Jesus Christ. This will be the last time we will be greeting you all while here on furlough in America. Our date for returning to Bulgaria is October 5th. We regretfully acknowledge our inability to have visited with all of you. It has been good to be in America and visit with churches, friends and family. During our time here we have had the blessing of visiting my father Martin Welch, who is 79 years old and in poor health. We covet your prayers for him. While here I also had the blessing and privilege of baptizing my 21 year old son, Mark. Our prayer for him is that he would present his body as a living sacrifice to God, which we believe is the best thing for anyone. Since being called and surrendering to go to Bulgaria in 1993 it has been our greatest desire to preach the gospel of our Lord Jesus Christ and to help the Bulgarian and Romanian preachers to do the same. In 18 years of missionary service we have had the privilege to help a number of national pastors: Yashar, Ahmet, Nasuf, Demir, Ali, Alish, and Hassan, just to name a few. These men were from all different walks of life but they all had a common salvation in the Lord Jesus Christ and a desire to preach and spread the gospel of the grace of God to their own people. We have tried to faithfully supply these men with Bibles, songbooks, CDs, DVDs, and the funds to meet their needs. We were saddened recently to receive news about the death of one of our national pastors whose name was Hassan. He was only 59 years old and is survived by his wife, Kadrie, four children, and many grandchildren. He was a good preacher who loved God, his family, and the church. He was a real inspiration when it came to prayer and he had the faith to ask, seek, and knock. Many times I have seen him receive an answer from God, find a way through God, and have the windows of Heaven opened to him by God. He was a good shepherd of the eight churches he pastured. I enjoyed being with him in worship services, but from now on his place will be empty, and he will surely be missed. I look forward to worshiping the Lord with him again one day in Heaven. Greetings we send to you all in the name of our Lord and Savior, Jesus Christ. I am thankful for the high calling of God in Christ Jesus to preach the gospel of Christ. For I am not ashamed of the gospel of Christ: for it is the power of God unto salvation to every one that believeth; to the Jew first, and also to the Greek. Romans 1:16 We are thankful for being sent nearly 20 years ago by our local, New Testament church, Galilean Baptist Church (Pastor David Fredrick). By God’s grace and your faithful prayers and support we have been able to go and preach in the field that the Lord has called us to work in. Our work is a labor of love that is accomplished only through the Lord, His grace, and the people of God. Since returning to America in April we have been in over 30 churches. We have presented our burden for the Bulgarian and Romanian people. We have also spoken about some of the special needs of our ministry. Our work overseas is centered on the local churches. We hold church services every day of the week in different villages. I attend these services with our local national pastors. We help these pastors with their various needs in order for them to be able to reach these churches with the gospel. This is where the need of transportation arises. We are saving up money toward a vehicle for ourselves and also for some of the national pastors that work directly with us. We are also trying to raise extra funds for gasoline expense. We currently pay seven to eight dollars for a gallon of gas. These national pastors are good men and they need our support to reach their people with God’s Word. This is our main concern and objective. Perhaps you could help with this real need by taking on one of these pastors in the amount of 100 dollars a month. The support can be sent to us and designated for national pastors. On April 25th, our dear Bulgarian neighbor, Grandma Gina went to be with the Lord. She was 95 years old when she passed away. She was severely crippled from arthritis and suffered daily from the pain associated with that disease. Grandma Gina lived alone and would have to crawl on her hands to get around her little home. She was so ill and very poor but more than anything she was lonely. We often visited her during the five years that we were neighbors. The Lord touched my wife’s heart and impressed her to read the Scripture to Grandma Gina and to sing hymns and pray with her. Grandma Gina responded with an open heart to all these things and in time received the Lord Jesus Christ as her Savior. Although she was blind in one eye and had cataracts in the other she began to read the New Testament daily. She also loved the hymns and started singing them heartily. “Pray that God would take me to heaven soon”, Grandma Gina would say every time Jane grabbed her withered hands to pray with her. And God shall wipe away all tears from their eyes; and there shall be no more death, neither sorrow, nor crying, neither shall there be any more pain: for the former things are passed away. Revelation 21:4 We will miss her dearly but we look forward to being reunited with her once again in heaven. At the end of June our 16 year old daughter, Sarah had major shoulder surgery at a hospital in Bristol, Tennessee. She had injured her shoulder from a fall four years ago in Bulgaria but the bone damage went undetected by the specialists there. Sarah’s condition worsened since our return to the States and we sought medical attention for her. An x-ray revealed that there was a one-inch bone chunk imbedded in the ligament of the shoulder socket. We are very thankful that this was discovered and that she could get the medical help that she needed. Sarah is doing well since the surgery and will begin physical therapy in August. I am thankful for the gospel that we preach. To see people come to our Lord Jesus Christ through the preaching of the Word of God is our desire I've witnessed many times the power of the gospel of Christ arid how it can change a person from the inside out. Shaban is 45 years old and lives in a Bulgarian village called Dalgopol. The first time I saw him was at a church service and he seemed unresponsive and cold to the gospel. But the Holy Ghost was dealing in his heart and bidding him to come to Christ. A couple of days later I couldn't believe my eyes when he walked into a church service again. Shaban had become a new creature in Christ. He now loves to attend the church services and sing the hymns. When he wants to testify about the Lord everyone is edified. Please pray for Shaban, his wife, and his children. In the month of February our 16 year old daughter, Sarah, became seriously ill. She was rushed to the hospital and admitted into the intensive care ward. She had all the symptoms of meningitis; however, all the tests came back negative. She spent 12 long and fearful days at the hospital in Varna, Bulgaria. When she was released we were told that she had contracted an unidentified virus. Sarah recuperated at home over the next month and slowly improved. She is now enjoying good health and thankful for all of your prayers and concern for her during that illness. Jane and I also want to express our gratitude to the churches and individuals who prayed us through that difficult time. On March 11th our son-in-law William and our daughter Hannah, along with our two grandsons Carrick and Christian arrived in Dabravino Bulgaria. William and Hannah are both very excited and grateful to be a part of the mission work in Bulgaria and Romania. They have already begun language studies and are attending church services in the village. They are living in our home while we are on furlough in the States. We are so thankful for how the Lord has worked out this situation for them and for us. Please remember them in your prayers. On March 29th I arrived at the Dulles Airport in Washington D.C with my wife and our five children. We praise the Lord that we had a good trip back to America. We are presently residing in Sugar Grove. Virginia. We have been visiting churches in Virginia and Tennessee and look forward to visiting many others over the next five months. It's a blessing to be back in the United States and we are looking forward to seeing our friends, families, and supporting churches once again. We send greetings from the churches in Bulgaria and Romania. We have seen the Lord work much in the year 2010. We are thankful for the privilege of laboring together with God, although I must admit that I feel like the little boy who helped his daddy build the big house. God has been merciful in letting us have a part in building His church. At a church service in the village of Komarovo I preached in Turkish from Psalm 40. The people received the message well and it was such a blessing to see how they could rejoice in the Lord because of the "new song" that He has put in their mouths, "even praise unto our God." We have seen this new church grow in the Lord, in faith, and in number. This past summer the believers from Komarovo followed the Lord in baptism at a worship service we held on the riverbanks. I believe that because of the "new song" of these new converts, many have seen, and feared, and have trusted in the Lord. Recently I have been taking a young man named Emra to some of the church services that we hold in other towns. Emra is 18 years old and has had a rough life. When he was just 13 years old his mother (his only guardian) was killed in an accident. Since then he has lived with whoever would have him. Hassan, one of our national pastors, has opened up his door to him many times. The Lord has used this and is working on Emra's heart and we would ask you to pray for his salvation. We are proud to announce the birth of our second grandson, Christian Asher LeFevre, born to William and Hannah LeFevre on December 20th. William and Hannah, with their two sons, are looking forward to coming to Bulgaria in March. Please pray for them as they prepare to leave the States, and also for the Lord's blessings on their new life and ministry in Bulgaria. We have been making final preparations for our furlough in America. We will be arriving in the States at the end of March and returning back to Bulgaria at the end of August. There are many particular needs that come with such a trip and we would covet your prayers concerning God's provision and guidance. The Lord's work here in Bulgaria continues to flourish. The other night after church services in Marcovo and Sneshna we stopped in a village named Komarevo for the first time. We went to the home of a woman called Elmas. Her daughter is 45 years old and became a Christian just a few months ago at our meeting in Sneshna. We sang gospel songs at the home and prayed with the people there. These people were very touched and God's Holy Spirit was speaking to their hearts. Then they cried and rejoiced when we told them we were going to start a gospel meeting in their village. While there we also gave away DVDs that have Turkish hymns and testimonies, and a message from John 3. It was wonderful to see such a hunger for God and His Word. While we were singing the hymns in the house some of the neighbors started coming over and asked why they had not been invited to the meeting. Well, of course it was because Elmas had not known that we would be coming but by the end of the night we all could tell that God had gone before us. Just recently, in the village of Dalgopol we had the great blessing of celebrating the birthday of a young man named Ali. He is 25 years old and is mentally and physically handicapped. He lives with his mother and it is in her home that we hold a church meeting. It was a few weeks ago during a church service that we were taking requests for songs and I asked Ali which song he would like to sing. Some of the folks there said that he didn't know any of the songs. But I told them that he probably knows more hymns than any of us because the church has been meeting in his home for years and the Lord knows he has been the most faithful member. Then his mother told me which hymn he likes and so we all sang it. Afterwards I asked when Ali's birthday was and they told me it was in the month of May. But we decided that even though it had passed we would celebrate it in October. And what a celebration it was! All of the church folk got involved in the preparations and on the day of the celebration there was a houseful of people. We held a church service first and then we celebrated Ali's birthday. Ali was so happy that he cried. At that same meeting in Dalgopol, Riza and his brother Shaban preached and testified. They are brothers and were both saved this past summer. They are in their early thirties and married and have several children. Their mother has been a faithful church member for years and prayed fervently for her boys. She gets such a blessing when they preach and testify in the services. In the past she cried and prayed for them to be saved and now that they are she stills cries but the tears are tears of joy and thankfulness. A few months ago we announced that our son-in-law, William LeFevre, and our daughter Hannah surrendered to the mission field. If you would like to contact them for a meeting, enclosed is their prayer card. Please remember them in your thoughts and prayers. Greetings we send you all in the name of our Lord and Savior, Jesus Christ. To begin with I would like to thank the Lord for the work here. It makes all the difference when God is blessing. It has been refreshing to see His Spirit working in people's hearts and lives. Riza was saved not long ago in one of our church services in the town of Dalgopol. I have written about him previously and now it seems that the Lord is calling him to preach His Word. Last week in his home church he preached for the first time from the gospel of Mark. Everyone was blessed and God spoke to our hearts through his preaching. When the service was over we all rejoiced in the Lord knowing that God was working among us. I had the privilege to visit 5 of our churches pastored by Bro. Demir who is a national pastor from the city of Provadia. I have not been in these churches for some time and it was good to see at each church there were new converts. They were all so happy to give their testimonies about how they had come to the Lord and gotten saved. I am thankful we have stayed with preaching the gospel of our Lord Jesus Christ (Rom.1:16). People continue to come to Him and are saved by the blood of the Crucified One. We continue to produce and distribute DVDs of singing, testimonies, and Bro. Ralph Cheatwood preaching. The Lord is using them all over this land. Last week we sent over 50 DVDs to Spain with a Turkish family from one of our churches. The family works there and said that there are over 200 Bulgarian-Turkish families in their area. In closing I would like to mention that in February of 2010 we will be applying for permanent visas. We have been on the mission field for 16 years through your prayers and support and this is the first time we have had this opportunity. Up to this time we have only been able to purchase yearly visas at a cost of $5,000. These permanent visas will cost about $10,000 . We would appreciate your prayers concerning this need. We would like to thank you all for being so faithful in supporting our Lord's work here during these difficult times. We are aware of some of the financial problems many of you are experiencing, and we want you to know that you are in our prayers. We are also grateful for the support and prayers concerning obtaining a residence visa in Bulgaria. This visa was granted to me at the end of June. After that we started the process for my wife's and children's visas. They should be completed by September. Our Lord's work in Bulgaria continues to flourish. There is still a hunger for the Word of God in the churches and among the lost. We have been bringing in car-loads, van-loads, and sometimes bus-loads of people to special church services that we have been holding in our village of Dabravino. The believers are encouraged by the hymns, and by the many testimonies of God's goodness; but best of all, the Word of God is preached. Bro. Ralph Cheatwood preaches at these services in Dabravino on Sundays. The Lord has done a great work through him and his ministry. We have been holding church services for the past 15 years in the home of a Turkish woman named Melek. Last month, tragedy came to her home when she found out that her 35 year old son had been killed in a building accident. She and her husband were grief-stricken along with the rest of the family. Many of the believers visited them and prayed with them during those difficult days. What a blessing it was, when a couple of weeks ago, Melek and her husband attended one of the special services in Dabravino. They stood and testified of the grace of God, and the peace that He has given them in the midst of all the darkness and sorrow. Everyone that had grieved with them was now rejoicing that the Lord had given them the victory. (2 Corinthians 4:4), but God is still working and saving souls every day, and we continue to invite sinners to come to Him. We have the privilege to announce the engagement of our son Matthew Martin to Erin Chesney Minton. Erin is the daughter of Daniel and Cindy Minton of Bluff City, Tennessee. A September wedding is planned. Our prayer for them is, that the Lord would bless them, keep them, and make His face shine upon them. (Numbers 6:24-26). Glad tidings we send you from the brethren in Bulgaria and Romania. God has been good to us throughout this past year, and as always, has blessed us in so many ways. In this letter, I would like to look back on the year 2009 and relate to you a few of the many works that the Lord is doing in our midst. I know it will be a blessing to you, who have faithfully supported this ministry through your prayers and offerings. Please remember a Turkish pastor named Hassan in your prayers. He recently suffered a stroke during a church service in Kamarovo. He was so excited about this new meeting that he hardly slept the night before. He brought a message from Mark chapter 1. He told how he had been saved twenty years ago and how the Lord had changed his life. He stopped suddenly and asked the believers to give testimonies. It was evident that something was wrong with him as he lost mobility of his right arm and his speech became slurred. We excused ourselves from the service and took him to the hospital where he was admitted immediately. Hassan is home now, doing fairly well, and attending meetings with me once again. He certainly would be comforted knowing that you are praying for him. A fifteen year old boy named Iusniu, has been coming to one of our services for about a year now. He stands and gives good and encouraging testimonies about how the Lord saved him and daily helps him. He doesn’t know how to read; but, little by little, he has been learning from the gospel songbook that we gave him. Just last week, we also gave him a New Testament. He was very grateful and it is wonderful to see that he has a desire to go with God. A few months ago, we held a special church service in our home for the Bulgarian widows we minister to. We asked Mitko, one of our national pastors, to preach to these ladies. He preached a simple but powerful message from John 3. The Lord continues working in the hearts of these widows, and three of them have trusted him as their Savior. Please continue to pray for the salvation of Grandma Bona, Grandma Ana, and Grandma Marica. Throughout 2009, we personally distributed hundreds of singing and preaching DVDs. We are thankful to all of you who have helped us to do this. We have sown the Word of God, and we have seen people receive the Lord Jesus Christ as their Savior and join the church. In a normal week, we attend about fourteen meetings. We have made progress in the language and it is a real blessing to be able to preach in Turkish. The year has gone by swiftly; but, it is encouraging as we look back and know that the Lord has been with us and has not failed nor forsaken us. In March we began a new meeting in a town called Devnia. Two men from our church here in Dabravino named Mutalim and Jevjep have relatives in that town. Their relatives were desiring to have a church started and so they invited us to come. Most of our meetings begin this way. Someone has a burden for a friend or relative to hear the gospel of our Lord Jesus Christ preached and a meeting is started. We would appreciate your prayers for this new church in Devnia and that the Lord would bless and protect it. I would also ask your prayers for an elderly Bulgarian man named Malcho. For many years he and his wife, Denka have graciously opened up their home and invited believers in their village to come there for a worship service once a week. They also enjoyed attending our other meetings whenever they could and they would faithfully stand up and testify about the Lord and His workings in their lives. But at the end of April Malcho came to our home early one morning and with many tears told us that his wife had passed away suddenly. Even in the midst of his sorrow he praised the Lord like he'd always done in the past. We attended her funeral the next day and our van was used as a hearse. Pray for Malcho that the Lord would comfort him and give him strength in the days ahead. In April my son, Mark returned to the States to graduate from high school and to further his studies there. Then on May 7th our oldest daughters, Grace and Hannah will be graduating from college. We are very proud of them and our prayer is that they will follow our Lord in their lives. We are also very proud to announce that our daughter Hannah will be married to William LeFevre on the 7th of June. We ask that the Lord would look upon this union and bless them as they serve Him together. In September we attended the birthday party of Ivanka who turned 76 years old. She is the lady who has opened up her home for us to meet together with the widows for Bible reading and singing. She is a very kind lady and the Lord has certainly touched her heart. Grandma Penka has witnessed to her for months and she is very open to the gospel. When she attended Grandma Gina's birthday party in August she was so impressed that she decided that she wanted to celebrate her birthday the same way. So she invited our whole family to her home along with her widow friends and we sang hymns and read from the Bible and prayed with them. It was a very happy time for all of us. And while we were singing a hymn Ivanka left the room and came back with a small stack of books in her hands. When I looked more closely I saw that they were two New Testaments and a Bible. When we finished singing the song Ivanka looked around the room and very simply and sincerely stated, "I have read these books and I believe what is written in them." That was it! Just a short testimony from this little lady but she said it with all her heart. On December 26th we gathered with those dear ladies again at Ivanka's home. Grace, Hannah, and Matthew were visiting for the holidays and they had the opportunity to meet the widows. The widows were so delighted to have all the children around them and they loved all the joyful singing. After learning that several of the ladies had spent Christmas Day alone we sure were thankful to the Lord that He had given us this privilege of being a blessing to these poor, lonely women- just by remembering them and loving them. In February Grandma Ivanka suffered a stroke during the night. The ambulance came and took her to the hospital in Varna. She was left partially paralyzed from the stroke not being able to walk nor speak. After a week she was showing some improvement and her daughter took her to her apartment to care for her. We all missed her so much. But just this past week she came back home to live. Her daughter or her son would have continued to care for her in Varna but she said she was lonely and wanted to be where all her friends were. I visited her and she is so weak that she can hardly walk. I cannot understand her when she speaks but she understands me. I told her that I was glad she was home and that we pray for her every night. Her widow friends have promised to visit her and take care of her daily. She looks so pitiful but she is so happpy to be home. We sure look forward to being able to have meetings in her home again if the Lord is willing. Grandma Penka has become so dear to our family. It seems the closer she gets to the Lord the closer we are drawn to her. Matt's mother and my mother died years ago and so most of our children have never known the love and care of a grandmother. Maybe that's why it's so easy for our children to love these older women- perhaps it fills an empty spot in their hearts. Just the other day Sarah returned home from visiting Grandma Penka and she was so happy and told me what a nice visit they had together. She said, " You know what!? I have seen how other grandmas are with their grandchildren and I always thought it would be so nice to have a grandma. Well, Grandma Penka is like a grandma to me now. Really! She's just like a real grandma would be." I had given Grandma Penka four Bulgarian New Testaments and she carefully and prayerfully gave them away. Then she was witnessing to a good friend of hers and this friend said that she would like a Bible. Penka told me, " I didn't have any Bibles left so I gave her my own!" We both laughed about it and afterwards I gave her several more Bibles. I can still hear her chuckling as we slowly made our way down the street that day. I think she finds it humorous that God would use an old, crippled woman to help get out the gospel message. Traiyana is 85 years old and she also is a widow. She lives in our village but during the winter months goes to Varna and stays with her son until spring. I really wanted to meet Traiyana and witness to her. Grandma Penka told me that Traiyana was an atheist and that she and her husband had been members of the Communist Party. She had been on my heart for some time but things didn't work out to visit her and I was really disappointed because I knew that she would leave the village soon. Then one evening in November I saw Grandma Penka and Traiyana standing in the road in front of our house. Grandma Penka saw me and called out. I opened the window to see what was the matter and she told me that Traiyana was leaving to Varna and wanted to say goodbye. I invited them in for a tea and they readily accepted. As we were introducing ourselves and our children to Traiyana I noticed that Grandma Penka was all smiles and she kept pointing at a package in Traiyana's hand. Then Traiyana overhearing what Grandma Penka was trying to tell me unwrapped the little package. Inside was a Bible. She said, " I was at Penka's home telling her goodbye because I have to leave this evening for Varna. She gave me this Bible and said it was a gift from you and so I wanted to come and thank you for it before I leave." I couldn't believe it! What a tremendous blessing to my soul! I really look forward to seeing her this spring after she has had that Bible all winter! Once again I want to thank every one of you for your many prayers and faithful support of our ministry in Bulgaria and Romania. The springtime is upon us and it is such a welcomed sight. The trees are all blossoming, and the birds singing and so much "life". What a picture of the resurrection life from the dead! With springtime also comes planting which always reminds us of the sowing of the Word of God. Ever so often the Lord will open a door to witness to someone special to you and you know it was God who made it possible to talk to them. One of my neighbors whom I have known for more than four years is a man named George Gochev. We call him Grandpa Gochev and he is eighty-three years old and a former Communist mayor of our village. He is a very devout Communist and although he doesn't claim to be an atheist he talks like one. He is more full of talk than anything else and he is a pleasant man and easy enough to make friends with. He helps us with whatever kind of village problems we have. He even helped me to learn bee-keeping as he himself is a bee-keeper. We love him and are concerned about him because he is lost and without God. The other day I happened to be with him and the Lord's Spirit started to move and before I knew it I was talking to him about how I became a Christian and "found Christ" and received Him as my Lord and Savior. I thank God for the desire that God puts in our hearts to tell loved ones how we have found Him. Grandpa Gochev listened to my testimony and to the Word of God attentively. Please pray for him and may it come to pass as in the scriptures, "I have planted, Apollos watered; but God gave the increase." 1 Cor. 3:6. In our main church where we try to bring in as many of the new and old converts as possible for church services, we are building a kitchen and dining room to eat in. It's such a blessing to come together for good fellowship in the Lord. Brethren, please pray for us as we labor in the fields of Bulgaria and Romania telling all of how we have found Christ and how He has found us. On September 11th my family and I returned back to the United States for a one-year furlough. We are thankful to be back and are looking forward to seeing our friends and families again. We were especially blessed to be able to visit recently with Pastor Herbert Noe, who is the pastor of our home church, Galilean Baptist Church in Livonia, Michigan. Please pray for him, as he has been very ill for several months. In this prayer letter we would like to give a brief summary of our involvement in the mission work over the last ten years in Bulgaria and Romania. We thank the Lord for His grace and mercy that He has shown to us over these years. We thank you also, for your faithful support and prayers toward this ministry. We came to Bulgaria in 1993. During the two years we lived there we learned the Bulgarian language while also going to village-house churches daily and conducting Bulgarian and Turkish services together with national pastors. We also did much evangelization by street preaching and passing out tracts. After two years we experienced resident visa problems and realized we would have to move and continue the work from Romania. We moved to Constanta, Romania and began learning the Romanian language. We also began seeking out Turkish Moslem gypsies in the city and in Turkish villages where we could hold church services. During this time we were also periodically making trips into Bulgaria and working there temporarily on tourist visas. After five years on the field we returned home in 1999 for a one-year furlough and had the blessing to come and present our work to many churches and to show them all of the Lord's marvelous works and to thank them for their part in this ministry. Upon returning back to Romania in the year 2000 we felt peace about working mainly in the country of Bulgaria. At this time also we began working at learning the Turkish language. My only desire in learning any of these languages was to preach the gospel of our Lord and Savior, Jesus Christ, and to be able to tell my own testimony of how I came to know Him. I worked at the language hard but for me it does not come easily. However, I am thankful that with God's help I am now able to preach in Bulgarian, Romanian, and Turkish. Presently we help support and maintain over 70 churches in Bulgaria and have helped to start six new churches since the New Year. I am a carpenter by trade and in the last three years I have helped fund and built with my own hands five churches in different villages, and also a feeding center for poor children. I visit as many of these churches as often as I can. I greet them from the other churches there and also from the churches in America. We work together with about eleven national pastors. Men that are interested come with us to hold the services and the way we go about training them is "on the road. They learn the Bible, how to pray, and lead songs, and to moderate a meeting, and to preach the Word of God by example. Most of our pastors are on the road everyday holding meetings in different villages. Most of them pastor anywhere from three to five churches and each church meets once or twice a week. We personally help these pastors and churches with financial support. We give the pastors gas money so they can get to their meetings and help with car maintenance. We purchase firewood for the churches and the children's feeding centers. We continually are busy with the upkeep of the buildings that are being used in these ministries. We help with the purchase of bibles, songbooks, and gospel cassette tapes. As far as the number of souls that have been saved I can't give an exact count but there have been many (numbering into the thousands). Most of our congregations are from 20 to 50 people. We hold baptismal services during the summer months and just this past August we saw about 100 believers get baptized. The Campmeeting in August was a blessing to all that attended. Everyone was given transportation to the meetings and was fed and given a place to sleep overnight. At the nightly meetings there were hours of singing, testifying, and preaching. There was much rejoicing for all that the Lord has done and we were all edified by what we saw and heard. Brethren, there is an awakening in Bulgarian and Romania among the Turkish Moslem gypsies and we are thankful to be a part of that ministry. We are grateful also to our many churches, friends, and families who also have a part in this ministry. During this year that we are home we would count it a privilege to present our work in your church.